By Marianne Schnall. This article originally appeared in the "Cause Celeb" section of In Style Magazine, August 1996. "It's a labor of love," explains Bette Midler as she bends down to pick up a piece of trash. Outfitted in denim overalls and rubber boots, the Divine Miss M is partaking in one of her favorite pastimes: park cleaning. 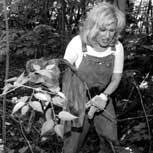 On this cloudy Saturday afternoon, as chairwoman and one of the founders of the New York Restoration Project, she's tidying Sherman Creek, a dilapidated wetlands area behind a city school in upper Manhattan. While most of the 100 on-site volunteers opt for rakes and picks, Midler prefers a hands-on approach, or rather, "hands and gloves," she says, laughing. "I love nature-in spite of what it did to me." Midler's cleanup crusade began in 1994 when her family decided to relocate to New York City after the Los Angeles earthquake. Once settled, she became distressed by the amount of trash littering the city's streets and parks. "In Manhattan, one of the richest cities in the world, are these places that are so neglected and have so much potential," she says. "I just can't stand the waste. I finally decided I had to do something." She contacted the California Environmental Project (CEP), a nonprofit organization she had supported while she was living in L.A. (she helped fund their Adopt-a-Canyon program), to create an East Coast version. With Midler's financial support and CEP's direction, the New York Restoration Project (NYRP) was founded in 1995. "It feels fantastic!" she exults. "But one day doesn't do it ...you just barely make a dent in this mess. But a year, two years, three years, you can really turn a place around." ©Marianne Schnall. No portion of this article may be reprinted without permission of Marianne Schnall . Marianne Schnall is a a free-lance writer and co-founder of the web sites EcoMall.com and Feminist.com. ©1995-2007 Feminist.com All rights reserved.